Cut the Cord with the New OAW4 Wireless Audio System! Anyone who has installed a home theater system knows that subwoofer placement is a critical part of getting a room to “sound right”. Unfortunately, you can’t always put the subwoofer where you want. How often has the best location for your sub been a place where it is simply impractical to run a cable from your receiver or surround processor? Originally, the Outlaws rode to the rescue with the OAW3 Wireless System. Now, we're pleased to announce the OAW4; a totally new system which provides better range, virtually non-existent latency, more zones, and an even more attractive price point! In an optimal environment, a range of 130 feet (line-of-sight) provides you with all the flexibility you need for subwoofer placement. In addition, the new OAW4 also delivers over 50 foot range through walls. And, as you've come to expect with our wireless systems, you can use it to send extremely low latency, full fidelity, 10Hz to 20kHz, audio to another zone, using a powered subwoofer, powered speakers, or a pair of our Model 2200 power amps with the passive speakers of your choice. If you are looking for a wireless system that transmits full CD quality sound, with full frequency response, and an easy plug and play interface, then the Outlaws are happy to have come to the rescue again with the new OAW4 Wireless System! The OAW4 Wireless system is not for powering passive speakers. It must be used with powered speakers or a powered subwoofer. Alternatively, it can be used to send audio from your source devices to your pre-amp, or to send audio from your pre-outs to a power amp. OAW4 System - Only $129! 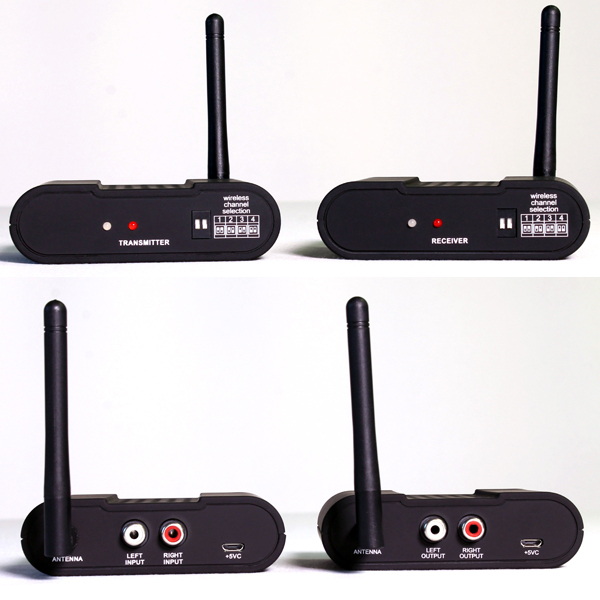 Dimensions (H/W/D): 3.875" (w/ Antenna) x 3.75" x 4"